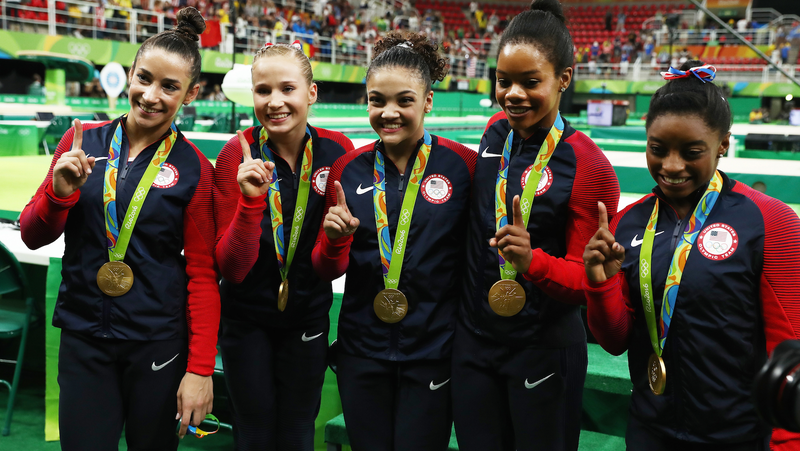 On Tuesday afternoon, the five-member U.S. women’s Olympic team won the gold medal for artistic gymnastics team all-around by what felt like 1,000 points for the second year in a row. The team, led by captain Aly Raisman, also revealed its new name: the Final Five. The scores for artistic gymnastics come from the combined average team scores for floor exercise, vault, uneven bars, and balance beam. Team U.S.A. easily outscored the other competitors in every event (with a final score of 184.897), so much so that the real suspense came from the struggle for second place. Ultimately, Russia earned silver with a combined score of 176.688, and China earned bronze with 176.003.
Notable moments included: Simone Biles’ everything, Raisman’s impeccable floor routine and mother-ducking her teammates around the stadium so they all looked excited at exactly the right moments, and Team China looking devastated every time the camera cut to them. The team’s official name, which Raisman led her ducklings in announcing just after the win, references the fact that Olympics gymnastics teams will be cut from five to four in 2020. Congrats to our women, the best ever.